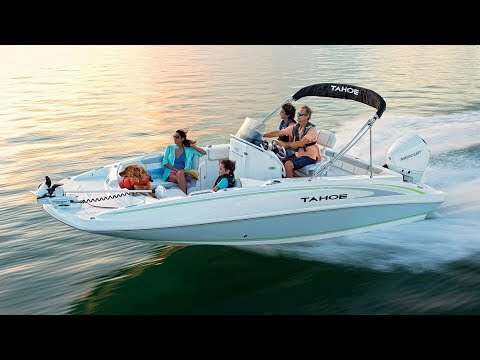 We’re excited to introduce you to the TAHOE® 2150 CC deck boat. It combines sleek lines and pontoon-level features and comfort with the 360-degree fishability of a saltwater fishing boat, ensuring this model is ready to become your family’s new entertainment center. For family, entertaining and fun, the fore and aft lounge seating offers the comfort you want for all day relaxing, and the Bimini top is perfect for escaping the sun. Additionally, fore and aft swim platforms with boarding ladders are ready-made for the perfect cannonballs. Or, take advantage of the rod holders, aerated livewell and insulated fishboxes as you fish away the day from anywhere on the boat’s perimeter. Versatile and stylish—that’s the TAHOE 2150 CC deck boat. Max. person weight: 1475 lbs. Max. person, motor & gear weight: 2300 lbs. Average hull weight w/motor: 0 lbs. Package height w/wakeboard tower folded: 7' 6"